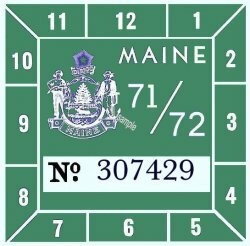 1971-72 Maine Inspection Sticker - $20.00 : Bob Hoyts Classic Inspection Stickers, Add a Final Touch to your Restoration! This 1971-72 Maine Inspection sticker has been restored and reproduced to perfectly match the original in size (3x3) and color (Front and back). It has our patented "Peel and Stick format that allows attaching to the inside windshield of your classic. This inspection sticker can be ordered with your antique License plate number on front for an additional $10.00 . Many Thanks to Larry Morton Finyl Vinyl, of Pittsfield, ME for providing us with the original.